Culture Hacker – Don't just change your culture – hack it! Don't just change your culture - hack it! Is the humble business card dead? Remember this scene in the movie American psycho when all the rich young bankers sat around the table competing with each other for who had the most perfect business card. The texture, the type face, the quality of the card and the beautifully embossed printing. It was a symbol of success and an important part of marking your career progressions up the greasy pole. Last week I met with a group of external guests at our offices. As is customary I present each one with my business card and eagerly awaited them to do the same, mostly because I had immediately forgotten their names between being introduced in the foyer and walking into the room. But wait as I did no cards were given, there was some humble apology of forgetting them and one person offered up a recent job change as the reason for not having one. Then I noticed that my team members also failed to offer their cards, even though I know they all have them. So what is happening to this basic business etiquette? Has it been outcast to become something we used to do in the old days? Is it seen as out of date and old fashioned to now give someone your card at the start of a meeting? I have to confess that I was disproportionately annoyed by the lack of business card exchanges, both from our external guests and from my own team. Personally I like the ritual of exchanging cards on first meeting someone new, it provides both a practical and emotional connection. It breaks the ice, gives you valuable information about who the person is, what their position is and insights into their brand. In Asia the exchange of business cards is almost sacred. There is a right and a wrong way to do it. You must receive the card using both hands and the study the card long enough so as to acknowledge the persons details before carefully putting the card away in a safe and respected place, namely not shoved into your jean pocket or used as a book mark in their marketing brochure! D uring my time in Asia I came to love the whole process and understood the importance of it, it really helped build relationships with people. After all, isn’t that what business is all about, connecting with people and building relationships? So is the business card dead? I really hope not! I wouldn’t mind so much if there was a technology alternative that everyone used, but there isn’t. Some people try to use linked in and connect after the meeting but for me this seems a bit hollow, it lacks the personal nature of choosing to share your information upfront, not when you have been ‘qualified’ after the meeting has finished! Long live the humble business card! 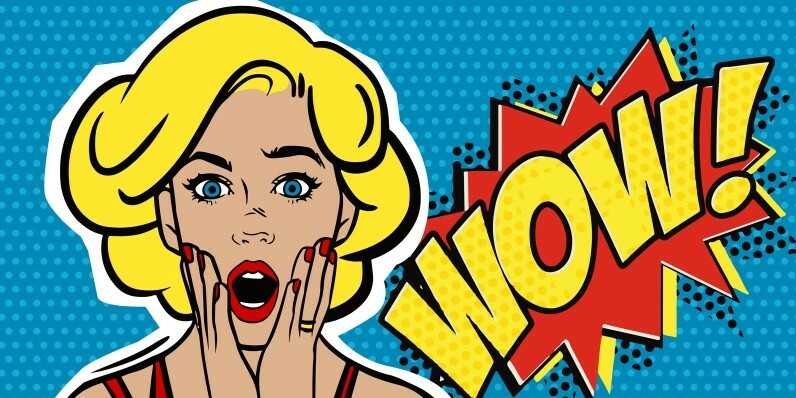 5 Easy Ways to Wow Your Team! Companies often talk about wowing their customers, constantly looking for ways to exceed their expectations in the hope of becoming more memorable for them. But how often do they apply that same principle to their own people, the ones expected to deliver those wow experiences to customers? If you are looking to create a service culture within your company then start with a strategy that also provides your people with a great service experience. At Jetts Fitness ‘Wowing the Member’ is one of our core values and all of our member service strategies start with applying the same to our people. We believe that you ‘can’t give what you don’t have’, what that means is that our team must know what it feels like to be wowed before they can create that experience for our customers. It is the leadership’s role to look for ways to demonstrate to our teams what a ‘Wow’ is by constantly looking for ways to surprise and delight them. 1 – Hold a Burrito Friday! 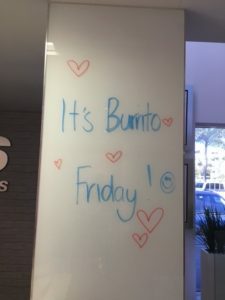 When the teams are under the pump and everyone is getting tired we throw a Burrito Friday – This is announced as a surprise when they come into the office on a Friday morning by our Reception team writing a message on our entrance wall. When the team see the message they usually share their excitement because they all love Burritos! 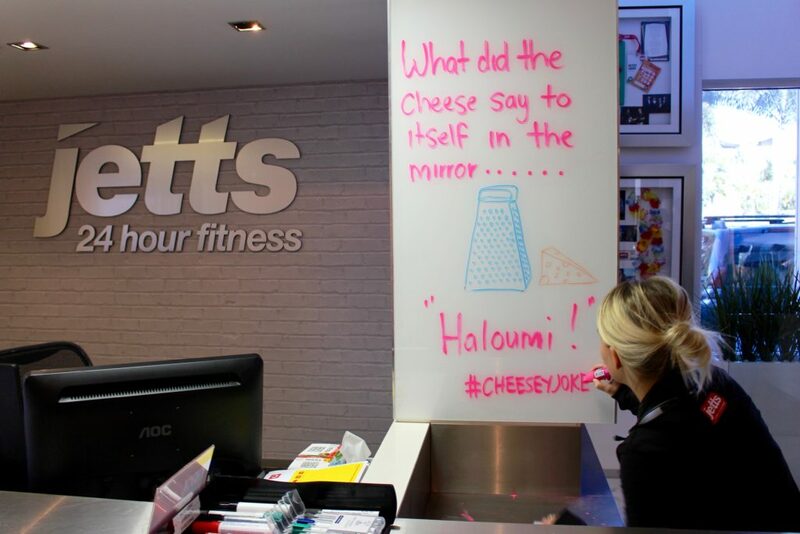 The team write their order on the wall and our Reception team take care of the rest – Simple! 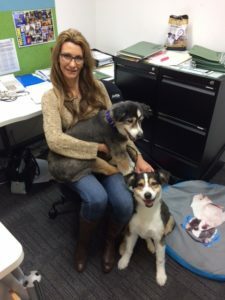 2 – Bring your dog day It has been scientifically proven that having your pet at work reduces stress levels (Dogs reduce work related stress). At Jetts we let our team bring in their dogs anytime they like but every now and then we have a ‘bring your dog day’ where we invite all of our team to bring in their K9 companions. It gets a little crazy but it always turn out to be a fun day and the team leave at the end of the day with high spirits. 3 – Hold a bake off Every now and again we run competitions for who can make the best cocktail, protein ball, raw bar etc. We supply all the ingredients and then the teams can bring in their own secret recipe ingredients. We split the office into teams and they work together to try and win the best in class. This also encourages teams who don’t usually work together in their day to day to get to know each other better. 4 – Promoter Call competition All of our team are given the details of a member who gave us a Promoter score in our Net Promoter System Survey http://www.netpromotersystem.com/. They then call the member to thank them for their feedback and to ask them if there is anything else they would like to share. The call details are then shared with the members Club Manager. The team member who calls the most Promoters wins a bottle of wine! Often for office based teams the customer can feel far away, by having them call happy customers they get the benefit of connecting what they do with the end result of the difference it makes to the customer. This is very motivating for our office teams and they love making these calls. Our club teams also love to know our office teams are interacting with our customers. It is great to have a structure to your company benefits and exceed your teams’ expectations with additions like concierge services and birthdays off, but you also need some spontaneity in your people strategy. It’s often these unexpected wow moments our teams talk about the most, they tell their friends and family what happened at work today and this builds our reputation for being a great place to work, which in turn attracts more talent. None of these ideas cost a lot of money or take much organising so why not try one out with your team and start to reap the benefits of increased productivity, increased customer service, better wellbeing and happier people. Remember is takes one to create one because Happy People = Happy Customers! Let me know you if you give any of these a go or have any other ideas of ways to wow your team! 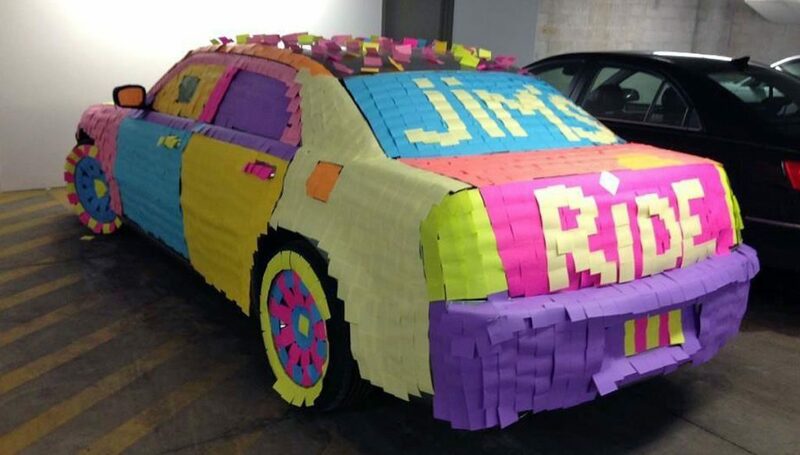 Does pranking improve team culture? Practical jokes are rife in my office and have been in many offices I have worked in. I am not sure if that is because I come from the health and fitness industry where the average age of employees is younger than most industries but pranking is a definite sub culture alive and kicking. 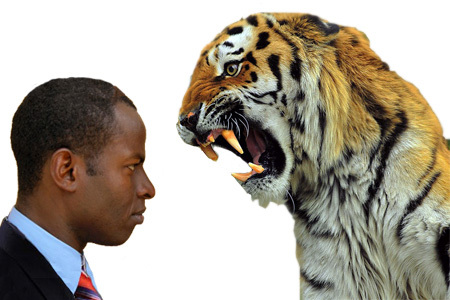 Great leaders exude confidence in all situations and are able to face anything that is thrown at them, so what is the secret to achieving this high level of self confidence? How do you prepare yourself for those inevitable situations that will require you to be strong? The answer is to expand your comfort zone by getting afraid often! A great culture starts at the front door of your company. If you are looking to ‘wow’ your people and your customers have a go at this simple culture hack. When it comes to great culture companies Zappos leads the way. Tony Hsieh founded the on-line shoe business after selling his previous company because he said he didn’t like its people. Hsieh was determined to build a new company with a great culture. If Culture is the moral compass then where is your company heading? Last month Peter Kell, Deputy Chairman of Australian Securities and Investment Commission addressed the issues with culture in the financial sector in a speech at the AFR Banking & Wealth Summit. He described the erosion of trust and confidence in the financial system and the global costs of misconduct arising out of poor finance sector culture. He was of course partly referring to recent events that have happened with organisations such as Target and their accounting scandal where staff over inflated their earnings to the tune of $21 million.